I started my book idea over ten years ago. However, I stalled on starting it properly for a few years for various good reasons but also for a bad reason. The bad reason was that I’d been to a large comics convention in the mid-00s and had felt somewhat out of place – too old and too female. I left feeling despondent – would there be much of an audience for my subject matter (childlessness and the circumstances that led to that)? It was a case of not seeing similar creators to myself represented in that environment, and feeling that myself and my work did not belong there as a result. A paucity of diversity, perhaps, especially in terms of gender, that I still see replicated to this day. This situation can be disabling for people’s enthusiasm, confidence, and ultimately their careers. Enter Laydeez do Comics! Laydeez do Comics have also announced a fabulous women-only graphic novel competition for work in progress. They are currently crowdfunding for it here, so do consider supporting this important new writing prize for women, for reasons set out here. I discovered Laydeez do Comics in 2009 and eventually plucked up courage to attend in 2010. That night, Nicola Streeten invited me to come along at a later date to talk about my work in progress. No way, I thought, but nevertheless I found myself in front of a lovely supportive Laydeez audience a few months later. It was when I spoke about my work there in 2011 that I first heard of Myriad Editions and the FGNC. Myriad is run by women and they publish many graphic novels by women. Going to Laydeez do Comics was a revelation in that I’d found plenty of other women making comics about all manner of autobiographical things, so I realised there might actually be a readership for what I wanted to write about. I was thus stricken by an overwhelming urgent imperative to write my book, so I entered Myriad’s FGNC with 15 pages of my WIP. Doing so gave me a deadline and thus a reason to focus intently on the project. It was also a horrifying reality check about what a huge undertaking this would be – but it felt very good to finally start properly. Starting is often the hardest part. Being shortlisted in the competition contributed immensely to my self-confidence and feeling that I was creating work that people would be interested in reading. Entering the competition was the single most important thing I did towards getting this book published, not only because Myriad eventually became my publisher, but also because it was the catalyst that gave me momentum to keep turning up at the page. I daren’t even think about where I’d be now if I hadn’t done so. Although this is not the first book I’ve had published as an author, it was my first graphic novel, and having my book published has led to career opportunities I would not otherwise have had. My advice is to turn up at the page a lot sooner than I did, and you have nothing to lose by entering. Potentially you could have much to gain, even if you don’t reach any lists. Make sure you’re not one those who didn’t go through with it: Go on – I dare you! Both Laydeez and Myriad Editions have been very supportive in my comics career. Music has always played an important part in my life. I learnt violin from the age of eight, and for most of my life until ME/CFS/Fibromyalgia stopped me, I was involved in music in some way – either in orchestras or indie bands. Over the years, playing music with others has provided me with lasting friendships, and even a husband. It was inevitable that any memoir I wrote would included music in some way – I’ve always been interested in its crossover with other art forms. In my early attempts at being an illustrator, I tried to find visual ways to combine music and art, but I always found it hard to represent one perfectly self-sufficient art form in another. In The Facts of Life, I used music in a far more literal way – to help describe the era; and to reflect the themes of the book by referencing popular culture that had informed my views in childhood. I’ve made a page-by-page Youtube playlist of all the music references in my book. It’s not altogether accurately representative of my musical taste – some of the songs mentioned in the book are there because of how they influenced my delicate formative brain with regards to pregnancy, motherhood and child-rearing. Listen to the playlist HERE. This is an annotated page-by-page guide of all the music references in my graphic novel/ memoir The Facts of Life. The book was published in March 2017 by Myriad Editions (UK) and Penn State University Press (N America). The playlist comprises songs that influenced me in my formative years, especially with regard to ideas about pregnancy and motherhood; and other songs I’ve collected that are significant to the themes and imagery of the book. Where a band rather than a specific song was mentioned, I’ve chosen one track by that band. One or two of them are bands I played in or to which I contributed music. p27 A broken condom results in Rizzo’s pregnancy in Grease. A similar incident takes place elsewhere in the book… Incidentally, I discovered that the actress Stockard Channing does not have children. p39 At age 9, I was rather intimidated by Terry Hall’s imposing image. Along with the lyrics, it somehow imprinted on my youthful brain that it was not a fabulous idea to get pregnant by accident when too young. p41 Adam Ant was on the cover of the first Jackie magazine I had, and AatA are one of Jack’s favourite bands. pp47,48 This song is sufficiently saccharine to bring on a hyper, but I secretly liked it at age 13. The lyrics suggest that if you don’t have children you will end up lonely and regret it – perfect for my themes. I don’t agree with this notion, of course. p52 April is packing her LPs to go to Uni – The Smiths were her favourite band at that time. p54 Subculture poster in my college friend Sam’s bedroom. I used to listen to New Order solidly in 1989 driving to a holiday washing-up job at a hospital run by an order of monks in Scorton, N.Yorks. p54 Pixies poster in friend’s room. One of the girls in this panel is Alison, so this is for her! p57 This was my band Girlboy Girl in which I played bass and wrote songs in the late 90s/ 00s. The song (lyrics by R Taylor) is about family and belonging (or not), so a perfect fit for the themes of this book. We made this video with the artists John Wood and Paul Harrison who currently work at Spike Island studios in Bristol. I did some of the drawings for this. I still feel very proud of this video. It was made in 1998 for video, hence quality. p57 Barely visible, but Rupert from Girlboy Girl is wearing a Lunchbox T-shirt on that page. They are a band we toured with around west coast USA in 2000 – lovely folks. Lunchbox are still playing and are situated in Oakland, CA. pp95, 116 I was pregnant for the first time, but did not know it, when we went to see Sigur Ros in Liverpool. This song subsequently became famous as the theme for the BBC’s Planet Earth. I do love the track, but it reminds me of tricky times, and there was no escaping those BBC idents! p183 The Unthanks are one of my all-time favourite bands and one I often sang along to while making the book. Like me, they are also from Northeast England where part of the book is set. This is the song I’d like to be played at my funeral. p185 This Prefab Sprout joke has been deemed acceptable on the ‘Sprout’s Facebook fan-page. Paddy McAloon is also from Co. Durham, like me! p184 Another T-shirt ref on this page. Jack, from the book, played guitar in Beatnik Filmstars for many years, and I played violin for them on one of their five Peel Sessions. (We saw Lofty from Eastenders that day in Maida Vale Studios restaurant!) One of my all-time favourite bands; this is one of their best songs ever! I used to tour with them to do their merch in the 90s, and my band supported them on a European tour. p185 Also mentioned in this panel is Roobarb & Custard – one of the best 1970s cartoon theme tunes ever! p192 I included some lyrics I’d written for my band on this page, because they were about oak trees and suffering from chronic fatigue (ME, as it later turned out). This is the original song that the lyrics are from. We recorded it for a cassette label called North of January in 2001 for a compilation: ‘Sweet Sweet Casio’ – the track had to feature a Casio keyboard. p210 This is a track by a band I joined in 2012 to play bass and violin. They’ve started playing live in Bristol recently – check them out – they’re really good! This was the song I enjoyed playing most with them. I had to leave the band because I had a graphic novel to finish (this one). I love this video because the imagery uses the elements – as I have in the imagery of my book. For the lyrics: “I’m just another lady without a baby”. And I interpret ‘the little clock inside’ as the so-called biological clock. I was 15 when this was in the charts, and I liked the edgy lyrics about girls at school already pushing prams, and the Pill. I took this as a warning. The humble oak plays an important part in the book. In the prologue, we are planting oak saplings, and the element wood is one of my visual themes. Well, for a start it’s called Babymaker, but it also seems to be about loss – and I love this band! In part 3 of the book there’s an albatross – it represents freedom from society’s pressures, and the element Air. And albatrosses are cool. Good song, but evokes a resigned teenage lassitude of being in limbo-land – of not yet being where you want to be. I grew up in a northern village. Crescent’s video contains footage of the river that also appears on pp122-126 of my book; and the bridge on p157. These places used to be on my daily walking routes when we lived in that area. And I’d often bump into various musicians who have played in this band, who also lived in the area at the same time. p218 “But this is not a thing on which to dwell”. We only get one life, so there’s not much point in spending much of it on regret. And regret suggests there was a choice, which is not always the case in whether or not a person has children. ps. This blog was inspired by our friend Jez Francis, who used to play bass in Beatnik Filmstars. He makes CDs and playlists for his family with written explanations about song choices. And, he and his wife Barb have a cameo in my book on p95 above – because we’ve been to many a gig with them. It’s ten years since I drew How a Baby is Made, a short strip which was to be the genesis for my recently published graphic memoir The Facts of Life. I entered it to the very first Observer Graphic Short Story Prize, even thought I knew it was probably going to be a much longer story (240pp, as it turned out!) I didn’t get anywhere with that, but, never mind, I eventually reached the shortlist of Myriad Editions’ First Graphic Novel Competition in 2012, and, they published my book. It is also published in N America by Penn State University Press as part of their Graphic Medicine series. At the time I started it, I’d had two early miscarriages, and the reality was beginning to dawn that we might never have children. I began to reflect on life’s expectations and where they had come from – social priming, family, education and politics etc. I began keeping a card file of memories stretching back to childhood. I’d also become obsessed with graphic novels and gobbled up Marjane Satrapi’s Persepolis, Jefferey Brown’s back-catalogue – and Maus by Art Spiegelman. 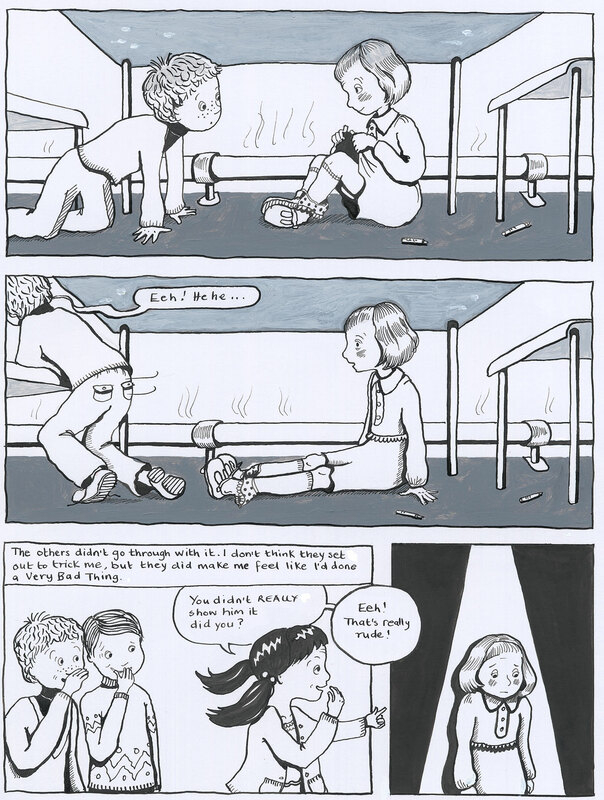 I was an illustrator – I could make autobiographical comics, too! This unavoidable urge to draw about my looming personal situation and its societal background would not go away. It was the first time I turned to drawing as a means of exploring and expressing hurt and complicated emotions. As I pointed out at my book launch, if someone had told me the project would not come to fruition for another ten years, I’m might not have believed them, and, if I had, I’m not sure I would have had the wherewithal to continue. As it turned out, I couldn’t do much more about it until 2010, because I was diagnosed with ME and had to cease work. The story wasn’t over until then, anyway, and it would have been a very different book if I’d carried on with it straight away. It was definitely better for having been put to one side for a few years: As is the case with some stories, it simply isn’t their time yet, and you fold them away at the back of the airing cupboard where they mature – at least until you shake out the moths which have left the holes in your story more clear to see. Here is the strip I drew in 2007, plus a page from my book The Facts of Life. If you’ve read my book, you’ll see how different the drawing styles are from the original strip – another element that benefited from percolating. I wanted to move away from cute, and, if I was going to spend a few years working on something, it needed to be a style I was comfortable with and one that people familiar with the subject matter, but not necessarily with reading comics, could relate to. Many elements from this strip remain in the book, such as our Sindy dolls enjoying relations under the bed, and the whole sorry sandpit debacle. I’d like to say here’s to another ten years, but, since my book came out I’ve had a bad ME/ Fibromyalgia relapse which left me bed-bound at first, and I’ve been unable to draw without considerable pain. Once again, many ideas have been consigned to the great airing cupboard in my mind (and a few sketchbooks), so let’s hope there comes a time when I can unearth them and get back to the only work I love. Let’s also hope for a cure for the chronic illnesses ME and Fibromyalgia, which wreck so many lives. After working on The Facts of Life over six or more years, if feels so good to say that it’s an actual book now and I’ve held it in my hands! I’ve also pleased to announce that, in a deal negotiated by Louisa Pritchard Associates, Myriad Editions have sold the N American rights for The Facts of Life to Penn State University Press, and I’m excited that it will be joining their Graphic Medicine series. I’ve long been a fan of Graphic Medicine and I’ve spoken about this work at three of their events and conferences since 2011. It feels like the right home for my book over the pond. It will be published there around the same time as MK Czerwiec’s (aka Comic Nurse) book Taking Turns. I met MK at a Graphic Medicine event that was part of 2011 Comics Forum in Leeds, and we’ve had a similar timeline to publication over the past few years. I’m very much looking forward to reading this book, which is a memoir about her time working as a nurse in a HIV/AIDS unit in the 1980s. Other excellent books that I’ve read from the series include The Bad Doctor by Ian Williams, Hole in the Heart by Henny Beaumont, and Things to Do in a Retirement Home Trailer Park by Aneurin Wright, all of which were first published by Myriad Editions in the UK, so PSUP already feels like home! In other good news, I’m delighted that my book is currently Editor’s Choice in The Bookseller for Biography/ Memoir. I’ll keep you up to speed next year with news about events I’ll be attending and at which I’ll be speaking about the book. All the very best for the festive season and wishing you health and happiness in 2017! The Facts of Life will be published by Myriad Editions and Penn state University Press in March 2017. I’m happy to announce that in March of this year, Arts Council England awarded me a grant (Grants for the Arts) to support the completion stage of my graphic memoir, The Facts of Life, which will be published by Myriad Editions. The grant will provide funding for the artwork stage of my book: It will cover materials I need to carry out the final artwork, a mentor for the duration (Hannah Berry), frames for an exhibition, and attendance at some comics events after the book is published. It also means that I can now set aside other freelance work and focus solely on the book for the next year. I feel very grateful, and fortunate to be doing this work. Thanks to the following people for their statements of support for my application, sage nuggets of advice, and support in kind: Corinne Pearlman, Hannah Berry, Bryan Talbot; David Gaffney, Matthew Roche, Katy Green, Ravi Thornton, Nicola Streeten; and John Austin. The Facts of Life – thank you!